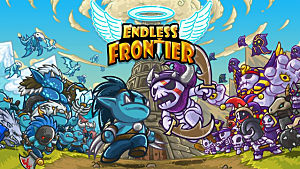 Endless Frontier is probably a huge surprise to any new player, regardless of how experienced they are with idle games. The sheer amount of depth in team building goes a lot further than what you see in the competition. The game is not without its faults. Hefty grind, ugly UI, and awful localization make it hard for some to get into but once you get past its superficial issues and learn you have a real taste for grinding and team-building, you're doomed as Endless Frontier gets its nails into you and really digs in there. This guide doesn't cover the super-super basics -- there's a certain fun to finding things out on your own, and I'm not about to take that away. But I am hoping to guide you along your first few revivals to get you prepared for the long road ahead. I am by no means a hugely experienced player. There are certainly pieces of information missing. But if you're having trouble progressing reliably, this is certainly a decent guide to start piecing your adventure together. Of course these are simple descriptions of the benefits of each, but I really cannot emphasize how important it is to stay on top of all of these facets for the benefit of longterm gains. Spirit Highlands only grants you 10 entry tickets per day, which you can use at your leisure. It's in your best interest to unlock as many levels of it as are available to you. 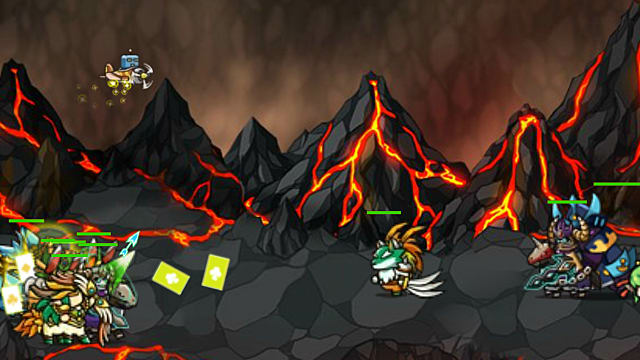 The higher your Knightage level, the higher you can progress into Spirit Highlands. Pets are valuable and you need to farm their fragments to make them more effective. You can use units in both your main lineup and the Time Shop in these battles. In addition, if you clear a stage with 3 stars you will not have to manually fight it again -- just choose "Complete Now" and you'll get the reward. 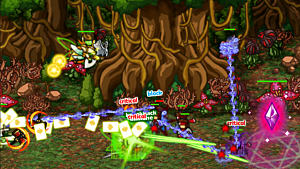 The Battle Arena pits you against other players in PvP. If you are in the top 50% in your league's rankings for the day you'll be bumped up to the next league the next day, but it all resets every 4 days and then you do it all over again. 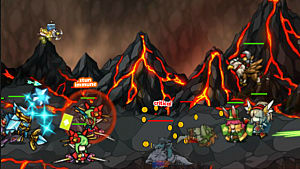 You get a fair amount of gems and honor coins from your daily rankings, as well as 10 gems per Battle Arena win. As a new player, that means you can reroll your opponent up to 3 times to ensure a win without losing gems (as each opponent reroll costs 10 gems). As you get deeper into the game you may be inclined to spend much more to ensure wins. Something to note is that the Battle Arena only takes into account your units' current enhancement levels, transcendence (later called "trans") levels, and skills. The Tower of Trial resets every 72 hours, and within that time you're tasked with completing set challenges with their own restrictions. This means a set group of units (randomly shuffled) with restrictions on tribe, gender, or star level depending on the floor. You gain one ticket every 20 minutes. Like the Spirit Highlands you can use units in the Time Shop, which you will end up doing often. The Tower of Trial is definitely the most difficult of the side-battle content, and you shouldn't be surprised if you lose a stage simply because your units are weak to the types of units in that stage. You want artifacts, right? This is the most self-explanatory piece of side content and doesn't have all that many surprises -- though smaller units and bosses in dungeons have varying strengths and weaknesses, and each dungeon (sans the King Slime) has a tribe restriction. To keep things simple: If you want to know what a dungeon's restrictions are and what the bosses are shielded against, tap on the dungeon name (not the Enter button) to see that information before you enter. 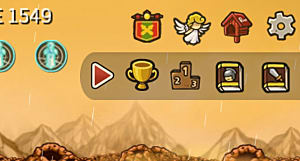 One is the achievement tab. It's hidden in the arrow at the top right of the screen. Keep an eye open for achievements and wander in there to grab up gem rewards. What general skills are available? Most high-level players claim The Explosion Shaking Heaven and Earth is the best and many stack all three skill slots with it for clearing irritating floors, but it's really up to you what you choose. You can have up to three skills at a time. 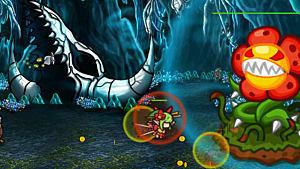 The first slot is available by default under the Unit menu, the next under Dungeon, and the last under Artifact. Each one has its own cooldown time, with the Unit skill being 40 seconds, Dungeon skill being 50 seconds, and Artifact skill being 60 seconds. Is it ever worth it to buy a unit with gems? Short answer: Not when you're new-ish. Long answer: Not when you're new-ish, because evolving units costs a ton of gems and in the start you need to be frugal. It may be worth it down the line when you're 6 months in and finally see that Steam Punk you've been waiting for. But if you're just getting your footing, it's better to be patient. There is so much to be said about building a team that I could not possibly begin to give you a good rundown that would be reliable. But I can describe the most basic principles behind effective team building. An effective team is one built around "cores" -- damage dealers. You choose your cores and then the supports that will boost them effectively. Most players choose 2 ~ 4 cores, depending on their luck and preferences, with the rest of their unit slots taken up by supports. You want to have at least one physical damage and one magical damage core to avoid getting stuck on shielded bosses, and to tear through particular tanking units in PvP. Once you've chosen your cores, you should first evolve them into their senior forms and then get busy enhancing them using medals. 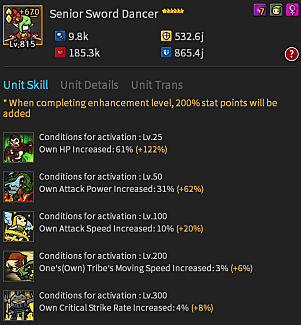 Enhancing does more than just increase their stats -- it also improves their unit skills. Which is a huge boon, to say the least. You want to focus all of your medals on your core units, getting them to be as high of an enhancement level as possible. Remember: Enhancement levels are effectively a unit's "true" level, effective across all modes and not just in standard stage progress. You may enhance some non-cores to get bonuses on their unit skills, but your main priority is your cores. You can choose to trans your cores at any time, and they should be the first you trans. Each trans adds an extra 50% to a unit's attack, defense, and HP -- making a fully 3-transed unit 2.5x stronger than one of the same enhancement level that has not been transed. Each level in these skills costs 700 gems, and each level affects how many of a race you need in your team for the skill to be available -- as well as how often or how effective a skill is. At levels 1 & 2 these skills will work if there are 2 or more of that race in your team. At levels 3 & 4 these skills will work if there is at least 1 of that race in your team. At level 5 these skills will work regardless of whether you have the required race in your composition. You can tell which skills are in effect based on whether their racial icons are greyed or colored in on the primary UI. The human option randomly completes a quest every so often. This can be useful, but if you're rolling in quests (and you probably are), this one's iffy. This one gives a chance to instantly revive your units on death. This is great in theory -- but if your units are dying, chances are they're going to die right when they get back up anyway. I cannot recommend investing gems into this skill. This one decreases your skill cooldowns based on level. This one is undoubtedly more useful than the undead skill, but its usefulness really depends on how active a player you are and your preferences. This gets to be less of an issue as you're further along in the game due to quest gold multipliers, but it's something that should be stated here in a beginner's tips guide. Quests all have their own durations, and there are certainly points in time where you're stuck sitting there waiting for a long duration quest to finish up so you can keep leveling up your units. Something you may not know is the maximum amount you can make off of quests at a given time greatly affects the amount of gold you get from treasure chests on the field. If you're waiting to make more gold, make sure you upgrade the highest tier quest you have until it at least costs the same amount to level as it will grant on that level. For instance, if a quest costs 27m to level and that level grants 100m, you should absolutely level it until the 27m reaches 100m. Then tap those chests! Not sure what your exact buffs to each tribe are? There's a menu for that! From there you'll be able to see what all your buffs are from your units and artifacts. It does not calculate your hero's race tribe buff into this screen. You'll just have to keep it in mind. Part of playing the game is accepting reviving more than you'd like to get more medals, and not just because you're at a wall. There's nothing wrong with that -- especially if you have some ways to make reviving less painful. It's going to be a grind either way. But there are ways to mitigate that to some extent. The first is via the Priest unit (human), which brings the amazing God's Blessing special ability. God's Blessing speeds the game up 5x for two minutes, granting the largest battle speed buff in the game. When seniored, the Priest brings a 5% chance to pop God's Blessing on a floor -- and each Priest brings its own 5% to proc it. The second is via the Dark Archer (undead). The Senior Dark Archer's special ability allows you to revive at 5% of the floor you revived on. For example, if you decided to revive on floor 1000 you'll come out at floor 50. Like the Priest, Dark Archers stack. They are a fantastic go-to for quick revivals early to mid-game. Often used in "Revival Teams", in which their bonuses apply. The last is the Elf secret skill. I went into that a bit above, but to recap: the Elf secret skill (available in the premium shop for 700 gems per level) grants you a chance to skip a stage as you progress. I shouldn't have to explain why this is so valuable -- and when paired with Priests and/or Dark Archers, you really start to see some crazy stage progression. This of course excludes gem units. You need a great deal of units to trans materials, often units you really wouldn't generally want or have. Stockpile what you can -- and if you have seniored units, be sure you stay on top of their trans materials to make your life easier. As an additional point on this, you can check every unit's required trans materials by checking out the Unit Book, which is found in the same menu as the achievement menu. 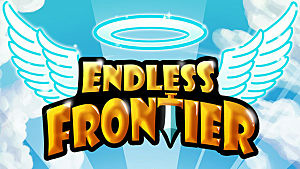 Is this all there is to know about Endless Frontier? Certainly not! But based on my own experiences and those of my friends, this advice should help you progress more linearly and with increased confidence. There's a lot to keep up with and know during your climb to the top, and what's found in this guide only scratches the surface.